Māori have traditionally played a wide range of sports and games, some aimed at teaching important skills, others practised as part of ritual and many more enjoyed as pure entertainment. Games are part of te whare tapere (the house of entertainment) – a branch of knowledge also including the performing arts. Athletic prowess was admired in traditional Māori society. Many sports built strength, endurance, agility or battle skills. Both men and women participated in mamau (wrestling) and para whakawai (training with weapons such as taiaha and patu). Also important were omaoma (running), pekepeke (jumping), porotēteke (acrobatic tests of strength and balance) and makamaka (throwing – often spears, darts and stones). Board riding, bodysurfing and riding the waves in waka (canoes) were all enjoyed. Māori were strong swimmers, who learned water skills from infancy. Māori played jump rope and games similar to tag and hide-and-seek. They also made moari (swings) – often over water – and pīoi (see-saws). Males and females of all ages played tī rākau – in which players threw and caught sticks in time to a chant. It was sometimes a way for warriors to practise hand-eye coordination. Whai (string games) were also popular. Players created patterns by looping flax strings around their hands. There were stories behind the patterns. Tātai whetū were tongue twisters that had to be memorised and recited in one breath. Tutukai and kurawiniwini were guessing games. A group of people chanted while passing an object between them and concealing it from whoever was ‘in’. When the chanting stopped that person had to guess who held the object. In tī ringaringa one player made hand movements while reciting a chant, and the second player had to follow the movements and the chant without making a mistake. Kite-flying was a favourite pastime as well as being part of various rituals. 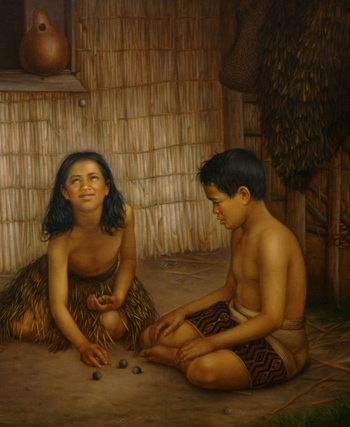 Pōtaka (spinning tops) and pouturu (stilts) were popular, as was retireti (tobogganing) using anything handy as the papa reti (toboggan). Karetao (puppets) were made of wood with jointed arms controlled by strings. Board games and knucklebones were also played. From the 1820s missionaries tried to suppress traditional Māori sports and games and Māori increasingly adopted European pastimes. Canoe racing and kapa haka (team competition in poi and haka) were among the few traditional competitions that continued strongly. From the second half of the 20th century many more traditional sports and games were revived, and new ones were developed that drew on tradition.